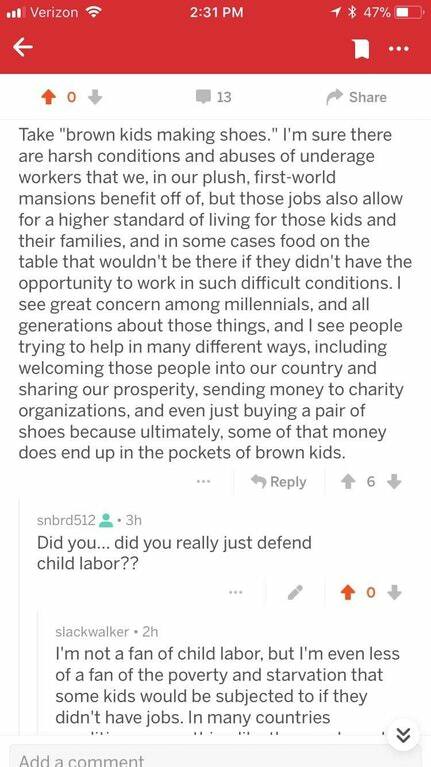 "Why child labor is good for kids"
It's like "I'm not a racist, but..." or "I'm not a sexist, but..." Pretty much any time where someone begins by specifying that they are totally not a bigot, will end with them proceeding to be a bigot, just as most of the time, if you begin with,"Technically it's not..." chances are pretty good it's exactly what you said it isn't and you need to hang your head in shame. On the blood and sweat of the third world. Thankfully he's not a fan of child labor...He's only a casual enthusiast. He's just into it when there's nothing on tv. Barely even a hobby. What these supply-side jackoffs don't realize is that poverty and terrible living conditions are a direct result of capitalism. Starving child workers in the third world shouldn't have to feel "thankful" to foreign capitalists for giving them enough money to stay alive, when those same capitalists are responsible for the sorry state of their country in the first place. What these supply-side jackoffs don't realize is that poverty and terrible living conditions are a direct result of capitalism. They also fail to recognize that workers, child or otherwise, wouldn't be in danger of starvation or homelessness, if Capitalism didn't decide to lock up access to basic necessities, making it all hinge on how many pieces of pretty paper you have. Food, shelter, water, and medicine are the very basic stuff needed to stay alive, yet people die for lack of those things, even though in many cases, we have more than enough of these supplies. In the US, we have an estimated ten empty homes for every single homeless person, yet we opt to let the homes rot and the homeless die, as opposed to letting them move in and maintain these places. Itsq bad that they defend child labor, but i think its worse that they use this logic to actually feel good about their consumption of goods using child labor.